Inky Fairy Designs: Designed To Color & Lil' Inker Designs Blog Hop!!! Designed To Color & Lil' Inker Designs Blog Hop!!! Welcome to the Designed to Color and Lil' Inker Designs Blog Hop!! This is the first stop on your inspiration journey! We are so honored and excited that Lil' Inker Designs is our Hue's Who for the Winter 2013 issue of DTC that we just had to throw a celebration! And because we just celebrated our FIRST year in your crafting lives, we thought having a birthday themed hop would be just the cherry on top! So please, join the ladies of Lil' Inker Designs as well as a few sprinkles of the DTC Color and Challenge Crews. Complete the hop for your chance to win TWO stamps sets of the winner's choice from Lil' Inker Designs! And of course check out Lil' Inker Designs blog for a prize as well!!! To complete the hop, follow along the order of the hop and leave a comment on each blog's post. Once you have done this, come back here and leave a comment that you have completed the hop. You should only leave one comment per blog. Prizes will be given out on March 8th. The hop is open from March 5th to March 7th. So don't miss out!!! Now that you know the rules, let's get this party started!!! Here is my card! I absolute adore this stamp set called Surprise. I love the vintage little girls and the matching expressions. One of my favorite sentiments is Belated Birthday Wishes because I'm forever forgetting birthdays! LOL I kept it clean and simple (I think I was channeling Lisa McKinney while I was creating!) and I love how it turned out. These would actually be really fast and easy to make a set of for a gift or if you were getting ready for a craft fair! I stepped out of my normal Copic zone and pulled out my Derwent Inktense pencils. I only have the 12 set so you can see you don't need all of them to create something cute! (Although, I am sure I will be adding to my collection as I really LOVE the look of them on kraft paper!) For their skin, I don't have a good skin tone in the 12 set so I used the peach color from Faber-Castell Gelatos. I hope you like it and thanks so much for joining us today! Here is the order of the hop! Your next stop is Laura! That so reminds me... I need to charge my camera too. I;ll check back later to see your card. You poor thing, I know how frustrating this can be. I scrolled down to previous posts just to see your work. Congrats on the new little one! Thanks for the hop.. Will try to come back to see your creation.. Very cute--love these vintage little girls and your coloring on kraft. LOVE thst stamp! SO sweet. cute, cute, cute! This is precious. Love that you used kraft card stock - it really is a great look (especially with the pencils), and yet I haven't been able to make myself try it yet. Like the box around it too - it is simple but really finishes it off! Such an adorable image, and the coloring is so sweet, I love the kraft base too! I love the vintage look! That image is adorable! Great job! What a sweet card. Love the vintage look of this image. Very nice coloring. I am a new follower. I love your kraft colouring, Carisa - beautiful card! What a cute lil card and I love the look on the kraft! Thank you for sharing. Love the vintage girls. Very cute! wow love the blue on that kraft! These stamps are so fun! Thanks! so super cute and fantastic coloring! Wow those pencils really look amazing on kraft...love the little washi tape detail. What a fabulous image! Great coloring! Love your blog and that baby card is adorable. I am linking up from the hop. I was reading the about you section on the side - I am married to my high school sweetheart too. It will be 12 years in July. Isn't it amazing to grow up together. fabulous card, the Surprise stamp is so cute! Just love this sweet little card and thanks for the tip on flesh tones. I completed the hop and really got inspired! Sweet card! I love it on that kraft paper with the colored pencils! 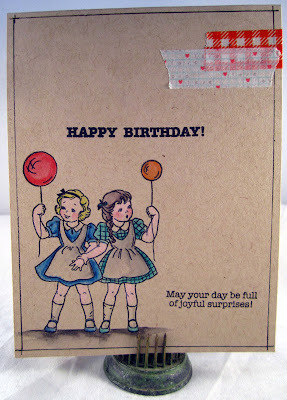 Very pretty card and love it done on Kraft, just makes it look that more vintage. I love the images. Reminds me growing up in the 50-60's and this kind of images in books and magazines. I love this set. Coloring is awesome, great touch with the washi. Cute little stamp set. Love how you've stamped and coloured on Kraft cardstock. This card is adorable! Love the popping colors on the balloons and the washi tape. Happy Birthday! I love the image and your CAS card! Very cute card! I love the simplicity of it! I love the vintage look. Really enjoying the Blog hop..it is my first time. I really like the vintage look. these little girls are so cute. Great job. The coloring on the kraft looks amazing. Fab job. Awesome card!!! I love it!